“The reason for concept cars is to actually push for new technology and new performance…and also to generate a lot of excitement. In the world of basketball shoes, you can say it’s pretty much the same thing.” Jordan VP of Design, Tinker Hatfield, couldn’t have said it better. Off the strength of the sneaker dynasty’s private event held yesterday in NYC, the Jordan camp unveiled its latest addition to the Jordan family, which is being dubbed as the “most technologically advanced Air Jordan of all time”: the Air Jordan XX8. In making the announcement among an elite crowd of lifestyle journalists and celebrity endorsers such as longtime Jordan wearer Spike Lee and NY Knicks superstar Carmelo Anthony, the company decided to launch a new video explaining the science behind the 28th pair in the coveted Air Jordan collection. 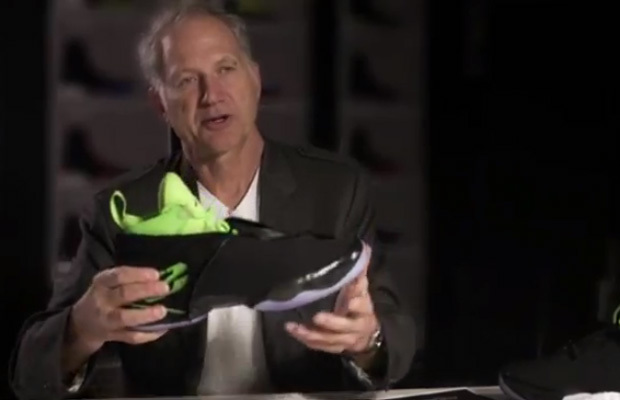 Watch as Hatfield, along with co-creator Josh Heard break down the hi-tech sneakers available Feb. 15, 2013, at $250.